The ship will be docked in Getxo at an attractive spot next to the leisure marina. An 800-meter walk to beach and mansion-lined promenade. An tourist desk is available in the brand new cruise terminal, where there is free, but rather slow, WiFi. Getxo is a welcoming town, an attractive seaside location that provides visitors with an opportunity to enjoy its spectacular cliffs, which in some cases stretch out into the sea. Bilbao is about 20 km away. Most cruise lines provide a shuttle to Bilbao. The shuttle terminates at Plaza Moyua and from there it is an easy walk to the Guggenheim. Shuttle is about 15 Euro. Note: Some cruise lines only tell you about the shuttle service the night before, as not to jeopardize their excursion sales! Unannounced by the cruise lines, the port provides free shuttle buses from the cruise terminal into Getxo, at approximately 20 minute intervals. The buses take a circular route, with stops at Areeta metro station (250m from the Biscay transporter bridge) and Agorta metro station, before returning to the port. Pedestrians can take a ride on the transporter bridge for 0.35 Euros each way. Buy tickets from the pay machines. The center of Bilbao is 20 min by the excellent metro system from Gexto. (the nearest metro Neguri station is a good 20 minute, but very pleasant walk on a nice promenade). Once passed the marina, turn right and walk by the mansions, turn left at the first intersection, keep on going and you will see the Metro Station. Buy a 2 zone ticket from vending machine. About 2 euros each way. Take the Metro to Moyua, (opposite track) and you will arrive at the same square where the shuttle buses arrive. From there on it is a 10 minute walk to the Guggenheim. If you Metro back, be sure you get on the proper line to Plentzia (there are 2 routes, which converge and run on the same track downtown). If you get on the wrong one, you'll end up on the wrong side of the river once you get out of town. If you do not want to waste too much time: take a taxi for about 30 euro. 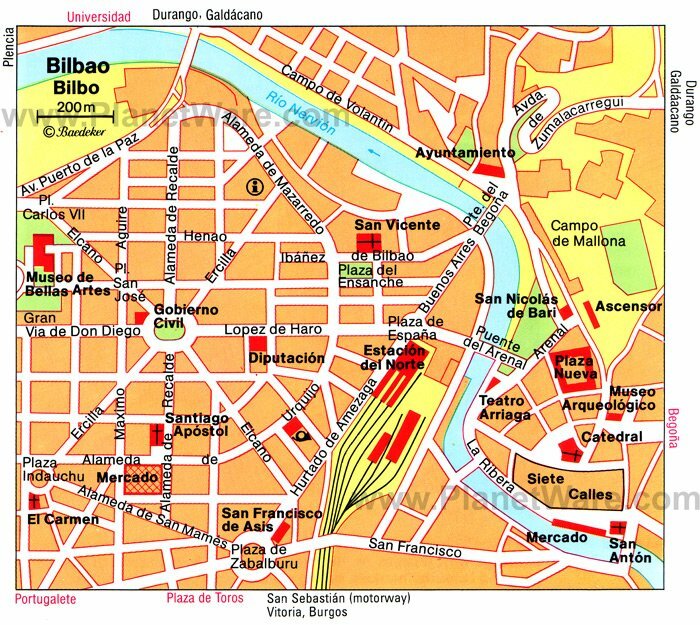 Printable map of Bilbao to take along. Getxo, the home of the new cruiser berth has been one of the most important residential areas in the Basque Country for more than a century. In addition to its natural beauty, Getxo offers the possibility of strolling among stately mansions, walking in the narrow streets of its Old Port, or of delighting in the view of the oldest transporter bridge in the world, Bridge of Biscay, built in 1893 and a contemporary of the Eiffel Tower, whose elegant lines it shares. The Basque city and cruise port of Bilbao in northern Spain has become one of the hottest destinations in Europe following the opening of the imaginatively-designed Guggenheim modern art gallery, which is an architectural work of avant-garde art in its own right. (Closed on Mondays). The Guggenheim does discount for those 59+ but you must have proof of age. Until then, Bilbao was very much a working city but it has always boasted a lively old town dating from the 14th century. Through the winding alleyways of the Casco Viejo you can stop to sample tapas at the many exceptional local bars and restaurants. The heart of this industrial port city is the Old Quarter, where the narrow streets are lined with Renaissance, Baroque and modernist buildings. The main sights include the Cathedral of Santiago, a Gothic church built at the end of the 14th century; the Bridge and Church of San Anton; and the Plaza Nueva, an arcaded square. Other sights include the arcaded Plaza Nueva and the Gothic Cathedral de Santiago. One of Spain's most important art collections is housed across the city at the Museo de Bellas Artes. the Tourist office is at Plaza Ensanche next to the Guggenheim. Look at Bilbao from a different point of view. Hop on a double-decker bus and discover the highlights of the city. They do not run on any Tuesday. Moyua is the center of town with many shops and department stores and sidewalk cafes. In the old town there is a large indoor market which is always fun. Seeing the types of food bought by locals is a great way to learn something about the local food culture. On the open aft decks of your ship you have excellent free WiFi courtesy of the port of Bilbao. Big shopping centers and department stores open from 10.00 to 21.00 or 22.00 uninterruptedly. These big stores open sometimes on Sunday. In coastal cities, in high season, shops are usually open past 22.00. Pharmacies open from 9.30 to 13.30, and from 16.30 to 20.00. In all major cities you can find pharmacies that open 24 hours. Pharmacies follow a rolling late-hour schedule, which is published in the newspapers, and is posted at all pharmacies.